When the Northern Monkeys get to take on the Southern Fairies in the UK's biggest Paintballing battle, each calander year. Warped’s North Vs South is the biggest game in the country, and being north vs south has big pulling power for bragging rights for the next year! Held at an army base that is not designed for paintball, the logistics and organisation that go into this game must be huge, with 1800 players and set over a vast army base, this is one game that always gets a good pull of players. The Mayhem Militia always has a strong following at this epic encounter and we had 37 players in attendance, with some great characters in the mix at a 3-day paintball festival, this was always going to be pretty special. There was games on during the Friday and Saturday, and the big North Vs South game happening on the Sunday. Being a 3-day game really adds to the atmosphere of the event with a HUGE campsite! Everyone gets into the whole festival atmosphere, and the trade presence is excellent, with pretty much every major trader in attendance, and a fully stocked bar selling cold beer is always a great touch for the evenings. On the Sunday, the game kicked off at 10am, and this time Hostile Intentions were generalling for the South and they were absolutely excellent, they were super organised and really had the south team getting on the right buses (yes, real buses that drop you off into live areas) at the right times. The game is so vast, without using the buses all you seem to end up doing is walking, so I think this is a perfect addition to the last couple of years of this event, well done Jim and Tim! Getting shot in the arse by Stuart from NPF (playing for the North), which was worse than any pain a paintball could ever give me. Will I ever live it down? We had some super intense gunfights, and with so many players on each team when you found a gunfight, boy was it immense. The only downsides for me this year was walking, if you miss a bus it’s a long walk, I think the bottle testing should be more obvious, and I didn’t like the chronographing system with the raffle tickets, I would have preferred to have just been chronoed as I was walking on the field. 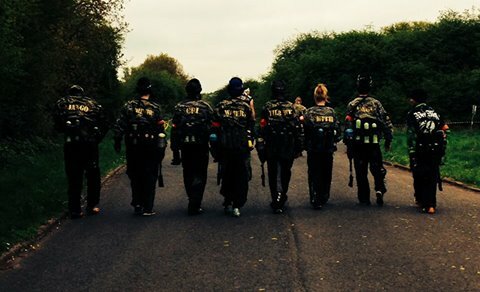 All in all, a fantastic event that should be on every UK paintballer’s calender. Oh, and top things off the South won, which is normally a rarety! Get in! Thank you very much to Jim, Tim and Matt for hosting this amazing event.